pannaq™ OHT wood is an innovative eco-solution by Qijuk, a Canadian based company that couples international forestry expertise with German engineering. The entire process is environmentally friendly, as only natural, non-toxic treatments are used, without compromises to aesthetics and functions. All of the pannaq ™ OHT wood is sourced from PEFC certified forests FSC carefully. It is then thermally treated with oil in Germany. The oil used to treat the wood is so natural that it is edible and FDA approved. ﻿The result of OHT, oil heated treatment, which was developed by Prof. Dr. A. Rapp and Prof. Dr. M. Sailer in close cooperation with the German Federal Research Centre for Forestry and Forest Products (BFH) in Hamburg, is a safe, natural and eco-friendly wood product with exceptional dimensional stability, improved resistance to weathering and decay, optimised insect repellency, outstanding durability and superior acoustic capability. OHT is the unique and innovative thermal wood treatment aiming to increase durability of domestic wood.The OHT procedure has three phrases: warm up, treatment and cool down. The OHT vessel is nearly completely flooded with pre-heated natural rapeseed oil in the warm up phase. The wood is then heated up in various duration to allow for different treatment intensities to tailor for different wood species and desired results. After the treatment, the timber is coole ddown and conditioned. The outstanding acoustic properties of OHT arises from the perfect vibrational behaviour: sounds are distinctly amplified and transmitted, whereas clanging frequencies are attenuated. Of more immediately recognisable benefit is pannaq's resistance to deformation caused by high humidity. 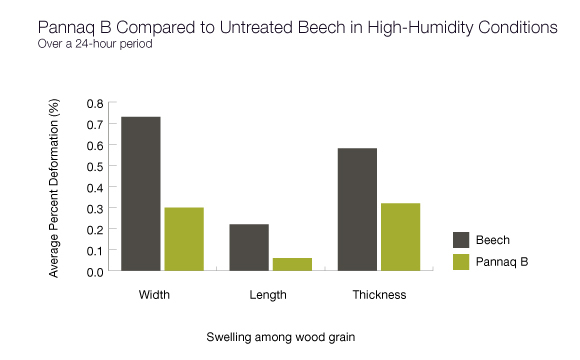 In laboratory testing of untreated Beech lumber comparedwith pannaq™ OHT, the difference in the effects of high humidity can be seen within 24 hours. These results are typical of all pannaq™ OHTwood species. Typical wood is quick to demonstrate water uptake due to humidity, with deformation seen in the width, length and even thickness of untreated lumber. Comparably, pannaq™ OHTB is seen to result in much less swelling - at least 50% less deformation overall. Heat exposure results in less warping or checking of the end product, preventing structural damage typically seen within a few seasons. For outdoor use especially, traditional decking requires annual treatment, frequent repair or replacement, and displays major degradation within ten years. In contrast, pannaq™ OHT wood requires less maintenance and is notably longer lasting, preventing needless waste and consumption of time and resources. The pannaq™ OHT process involves the use of natural materials and heat treatment to impart structural and aesthetic benefit to untreated lumber. Our commitment to green standards ensure that no chemical additives are used, and that the resulting product meets or exceeds a wide range of international standards for formaldehyde emission. pannaq™ OHT levels are microscopic when compared to standards of several major markets, including China's GB/T 15036.1-2009 and US standards set by OSHA and ANSI. These standards consider emission content 3 - 15 times greater than pannaq™ OHTas acceptably non-toxic. pannaq™ OHT also meets the more stringent requirements of Germany and Japan at .10 parts per million. High levels of heat are a concern in several areas of the home, particularly outdoors in places like patios or rooftop terraces. In these areas, heat can cause deformation of wood within a single day and contributes to the overall rapid degradation of natural wood products. The pannaq™ OHT process reduces the tendency of natural wood to shrink in extreme temperatures, providing better endurance and resistance to damage from warping or checking. Comparably, pannaq™ OHT B is seen to result in much less shrinking - at least 40% less deformation overall. These results are typical of all pannaq™ OHT wood species. On a continual basis, this can lead to major damage requiring frequent repair and replacement in addition to the typical maintenance required for natural wood furnishings. pannaq™ OHT wood demonstrates less shrinkage in extreme heat, preventing cumulative damage and reducing the need for frequent maintenance or refinishing. Developed as an investment in green living, pannaq™ OHT wood products are designed to last longer and provide greater comfort and convenience over untreated or engineered alternatives.